a long time. It is therefore essential to maintain the unique taste and flavor of the fruit by minimizing the physical and chemical changes during their process. 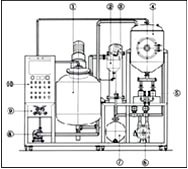 The method of minimizing the physical and chemical changes is to shorted the heating time(time for mixing, evaporation, and sterilization), which is very closely related to the quality of the jam products. In the Preserve Jam Vacuum Evaporator, the isolation of the fruit juice by a high osmotic pressure is quickly done due to a fast sugar precipitation speed during mixing. For this reason it is possible to reduce splashing and boiling-up and to shorten the evaporation time during vacuum evaporation. Further, It is possible to maintain the unique properties and flavor of the fruit since the heat is delivered fast to the center of the fruit and thus the heating time is shorted during sterilization. Still further. It is suited for the manufacture of high-class fruit jams owing to the chewy taste and the ease of spreading the jam onto the bread when the fruit remain as is.